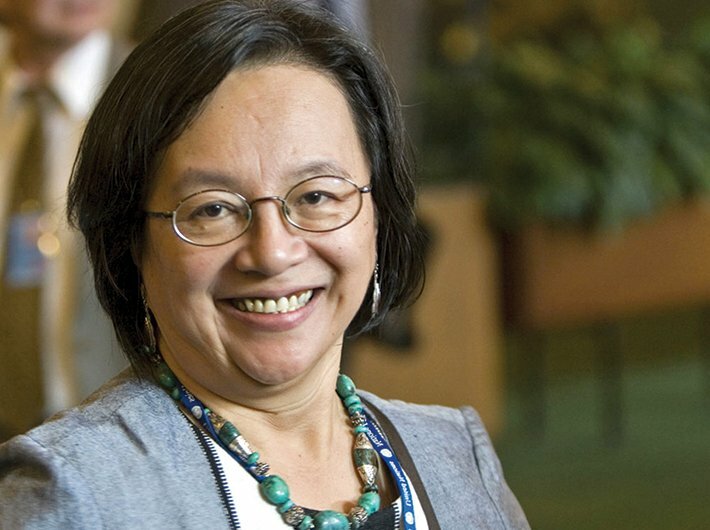 Victoria Tauli-Corpuz is the third UN special rapporteur on the rights of indigenous peoples and has held the position since 2014. Tauli-Corpuz was also the chair of the UN Permanent Forum on Indigenous Issues from 2005 to 2010. Her work for more than three decades has been focused on movement building among indigenous peoples and also among women, and she has worked as an educator-trainer on human rights, development and indigenous peoples in various contexts. She is a member of the Kankana-ey, Igorot Indigenous Peoples in the Cordillera region in the Philippines. As a human rights activist she is also the first recipient of the Gabriela Silang award, which was conferred in 2009 by the National Commission on Indigenous Peoples. She has been a strong voice for bringing a legally binding instrument that regulates TNCs for their human rights impact. Tauli-Corpuz has been a strong voice on the need for an international legally binding instrument to regulate transnational corporations (TNCs). On July 6, she addressed the UN Human Rights Council (UNHRC) in the opening session of the OEIGWG on TNCs and other businesses. She spoke to Shreerupa Mitra-Jha. In your statement to the UNHRC, why did you refer to the opening session of the Inter-Governmental Working Group on TNCs as a “historic” gathering? The UN has tried for a long time to get a legally binding instrument. It has never worked. There may be a better chance this time. It is really a historic gathering. I got involved in the UN Code of Conduct in the 1990s and saw its demise. I was also following what was happening at the Commission of Human Rights and every time it gets killed. My hope is that this thing will really move in a much better way. We really are at a historical moment. You cannot deny anymore how dominant TNCs are in deciding what is going to happen in our countries and in our lives – more than any age in history. This is the moment where there needs to be a regulatory instrument that will control the TNCs and other businesses. But [this is] also the movement to strengthen the capacities of people who are affected by transnationals to speak more loudly and get better results. I think this is the right moment to do that. [However] I am also very aware of the huge resistance against even coming up with such a thing. Indigenous people often bear the brunt of TNC interventions, particularly in the extractive industry sector. How big is this problem globally? It is really a big problem [because] every time I receive complaints (sic). There is a lot of resistance in indigenous communities against mining companies but one factor that makes that so is that indigenous people have fought to preserve their territories. The remaining of minerals, oil and metals are found in indigenous territories, and that’s why it is a very big [issue]. Where else will they go? We have a map in the Philippines, which shows where the ancestral domains of the indigenous people are and that’s where all the applications for mining tenements are found as well. And in Latin America, for sure, mainly because of the oil extraction happening there, for instance, in the Amazon part of South America, those are indigenous territories [sic]. In Africa, you can see how there is a massive entry of mining corporations as well. The lands of people of Kenya, Tanzania are the lands of pastoralists and the hunters and gatherers. It is not just in one part of the world. Among the Saamis in the Arctic region, in Sweden, they are resisting and filing complaints under the [UN] Committee on the Elimination of Racial Discrimination and as well as in the European Commission for Human Rights because their lands are being taken away for mining operations and these are lands that are pastoral lands of reindeers [as well]. It is a major problem for indigenous people and the companies involved are big. But the argument of the states is that they are the final authority on land use. Number one, we contest that because there is such a thing as native titles even before [there were] states [with] indigenous people on the land. So they have an inherent right to the land. But granting, without accepting, that the state is the final authority on land use, they still have to ask for the consent of the people and consult the people. International law requires that states at least consult people who will be directly affected by their policies and projects. It is very clear in the UN Declaration of the Rights of the Indigenous Peoples that before any project is brought to the indigenous peoples’ territories, free, prior and informed consent of indigenous peoples has to be obtained. Even in the existing covenants they will at least say that there must be social acceptability of the projects. So I don’t think states can use that argument to say that they can do anything they like. They are there to also balance the interests of the citizens and the corporations. And if they are colluding with the corporations to extract these resources even if under a lot of protests, that is why you see conflicts as well (sic). Could you give a few instances of communities getting negatively impacted through TNCs which could have been mitigated through a legally binding instrument? Take, for instance, what happened in Ecuador. Indigenous people complained and they filed a case against Chevron and then they won the case. Now nothing is happening even if they won the case because Chevron is withdrawing their operations and putting the burden on the Ecuadorian government to compensate the indigenous people and to do all the remediation in affected territories. You see, the TNC can just withdraw and disappear. And they will claim they are not liable because they left already. The same case happened in the Philippines. There was Placer Dome, a big Canadian mining company, and it polluted the rivers. The Philippines government filed a case against it for polluting the rivers and then they left! Who will the government bring the case to? I was in Peru during the Lima [climate change] conference and I met the Loreto people in the Pastacha region and all complained that the rivers were polluted by oil for the past 30 years. The government is going to do another bid because the bid for this company is ending this August. The indigenous peoples were saying that ‘can you at least remediate for us for [cleaning] the pollution and [ensure] there will be consultations before the bids go out?’ They had filed demands but now the bids are being approved without adhering to some of the demands. So you will be sending this lease out for the next 30 years again! That’s the kind of situation we see every day. That is why this legally binding treaty is going to be very crucial if it happens. There can be a tribunal where complaints could be sent. In your statement to the UNHRC on July 6, you said that “the line that separates corporate interest from state policy is sometimes blurred. This is particularly true of the Americas and Asia.” Could you elaborate on that? The state usually is also colluding with TNCs to allow for them to extract. Sometimes when they sign bilateral agreements or FTAs, they agree to facilitate the operations of the TNCs in the country. So sometimes the line gets blurred. While it is the responsibility of the state to comply with international human rights obligations, the state won’t comply when there is an investment agreement because enforcement mechanisms, when they [the state] violate the investment agreement, are even stronger. Their assets can be seized. In this situation, the social standards, the environmental standards will be sacrificed because of that kind of setup. They are more scared of the investment or trade agreement that they are party to. But extractive industries are here to stay. So how do you negotiate this situation of seemingly opposed interests of business and indigenous peoples? The ‘free, prior and enforced consent’ [FPEC clause] should be enforced. I don’t think there is any other short cut to that. If the indigenous peoples are consulted and [it] is inevitable that it will happen, then what about the benefit sharing to flow? (sic) How about the environmental standards to be adhered to? The rights of people who are directly affected by this kind of operations, who are displaced… what rights do they have in terms of being brought to a land that is of the same quality? When we talk of extractive industries, it is not just the mining companies but also the hydroelectric dam projects. What will be the agreements and the royalties for the indigenous peoples to allow for the hydroelectric dam to be built in their territory? These issues have to be brought to the table. That’s the moral thing to do, that’s the legal thing to do as well. As an indigenous peoples’ rights activist, what have been your experiences in the Indian context? We have a lot of relations with the Indian adivasis. Now we have a lot of relationship with northeast India and I know for a fact that there are a lot of hydroelectric dams being built. Despite the protests, these kinds of dams are already built. Recently I saw among the Nagas that their lands are already submerged. I am aware of the situation. I also know the case of Vedanta in Odisha, and the kind of struggle and support that was needed to win the case. I think the situation of adivasis in India is similar to the situation of a lot of indigenous peoples in the rest of the world. The Indian government, for instance, still argues that they are all indigenous in India. And so even if they sign the UN Declaration [on the Rights] of Indigenous Peoples, there still needs to be a lot of work to be done in terms of having this implemented. There are really strong indigenous communities there and are trying to do what they can to conserve their forests and better manage their traditional land. But there is still a lot of work to be done, to address the obstacles, for them to enjoy and decide what is to be done with their lands and resources. But what I also see is some level of discrimination against the tribals. For instance, the reference to them as ‘primitive tribal groups’ even in the constitution, I think, is something that needs to be changed. That’s a very discriminatory reference. I don’t think they are primitive. Much of their knowledge is contemporary, for instance, their knowledge of medicinal plants, in terms of conserving forests. Valuing the knowledge systems of these people who have contributed significantly is important. I hope, not just India but states in general, will realise that indigenous peoples are not their enemies and if they work well with them then there will be a better chance for the country to be more environmentally sustainable and there will be a better chance to lessen conflicts. What are your expectations of this legally binding instrument, if adopted, especially with the kind of resistance that the EU has put up? Given the time-consuming nature of UN processes, the treaty might take decades before it is actually adopted? We have already passed more than 30 years with this attempt to bring something like this to the UN. My hope is that this will not take more than 10 years to have it done. But realistically, considering the kind of resistance, my expectation is that the states who are the sponsors of this resolution will really work hard to convince the other states to come on board with this. Because it is in the interest of everybody to be able to put in mechanisms that will regulate TNCs’ behaviours. We cannot be in a world that the profits of the dominant actors [TNCs] matter more than anything else. If that’s the world we are going to see more and more then I will not be surprised [if] conflicts and many wars will happen. I think states have a responsibility in reaching that balance between economic development and ensuring justice and human rights for the most vulnerable population to be respected and protected. Even the Pope mentioned the need to regulate corporations. If the United Nations, which is expected to be balanced and is supposed to play its role [cannot adopt this legal instrument], then I cannot say what is going to happen in the coming years.